The spinal column is made up of a number of small bones called vertebrae that are lined up like building blocks. A hole in the center of each vertebra forms a tunnel in which the spinal cord lies. The spinal cord is extremely important because it carries the messages from the brain to the rest of the body. It is also extremely delicate, and the bony vertebrae help to protect it. Between each vertebrae, just underneath the spinal cord, is a little cushion, called an intervertebral disk, which cushions the vertebrae from one another and provides flexibility to the spine during movement. As a part of the normal aging process, these disks deteriorate, resulting in disk disease. Normally, each disk consists of an outer fibrous ring and an inner gelatinous center. (A good analogy would be a jelly doughnut). With age, this “doughnut” changes in consistency; the outer fibrous ring becomes fragmented and the inner “jelly” center hardens to a consistency of hard cheese. The fragmented outer fibrous ring may no longer be able to hold this hard center in place, and movement of the vertebrae on either side may suddenly squeeze the disk out of its normal position. Unfortunately, this material usually moves upward and comes to rest against the spinal cord, bruising it in the process. This “slipping” of the disk often occurs explosively, causing significant damage to the spinal cord and pain to the animal. In this abnormal position, the disk presses against the spinal cord, causing further damage. This type of disk disease may occur in dogs and cats of any age or breed but most commonly occurs in the “short-legged” breeds, such as the dachshund, French bulldog, Welsh corgi and Pekingese. 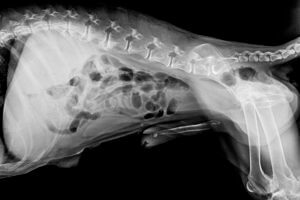 These symptoms indicate that the dog or cat has a problem affecting the spinal cord but not the exact location or cause of the problem. Disk disease, a tumor of the spine, or an infection of the spine may all produce similar symptoms. Tests are needed to determine the exact location and cause of the problem and to decide on the appropriate therapy. To accomplish this, the patient must be anesthetized for X-rays and collection of fluid from around the spinal cord. Myelography is an X-ray study in which a special dye is injected into the fluid surrounding the spinal cord. This allows any disk material pushing against the cord to be identified on the X-rays. Analysis of the fluid around the spinal cord helps to rule out other causes of the problems such as infection. In most cases, disk disease requires surgery to remove the disk material compressing the spinal cord. The surgery used most frequently to remove disk material from around the spine is called laminectomy. 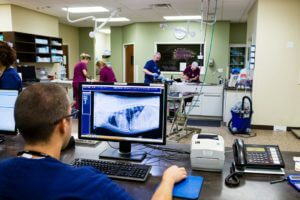 As time goes on, it is not uncommon for animals treated without surgery to suffer repeated bouts of pain, lameness and paralysis as additional disk material slips and compresses the spinal cord. With each bout of disk disease the spinal cord suffers additional permanent damage. Surgical removal of disk material from the spinal canal is the only treatment that provides rapid and maximal recovery of spinal cord function. Cortisone administration to animals with disk disease is of therapeutic value only during the first eight hours after the initial spinal cord injury. Current scientific evidence does not support the use of cortisone beyond this time. Furthermore, the adverse effects of cortisone (e.g., stomach ulcers) must always be kept in mind. For animals undergoing a laminectomy (surgery), the speed of recovery and the extent to which normal function of the legs is regained depends on many factors, including the degree of the damage to the spinal cord and the length of time that the spinal cord has been compressed by the disk material. Animals exhibiting severe neurologic signs (e.g. depressed feeling in their toes), a rapid onset of symptoms (hours), and a long period of time before surgery generally have a prolonged recovery period and may have varying degrees of permanent damage.